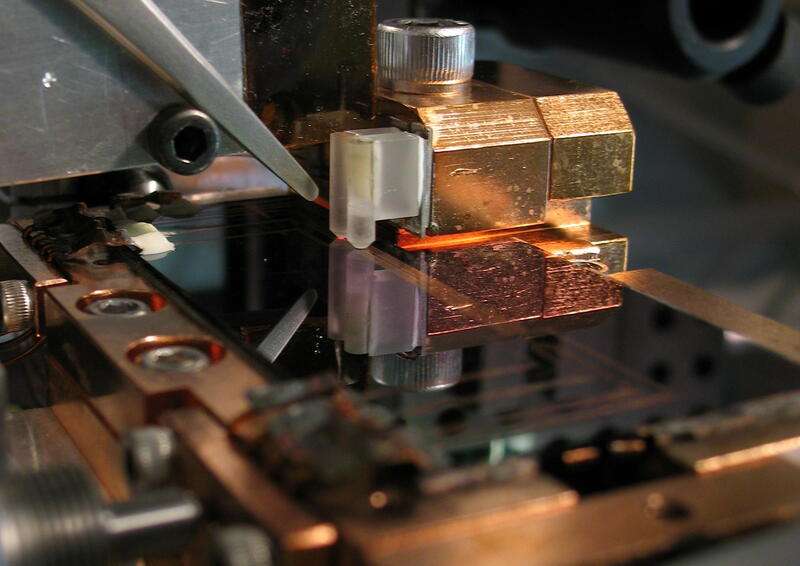 Using copper wires embedded in the atom chip, we magnetically trap and transport an ensemble of ultracold Rb-87 atoms into the optical cavity. We then transfer the ensemble into a single node of a standing-wave, optical dipole trap, resonant with a very far detuned longitudinal mode of the cavity. A 780nm probe laser, resonant with another longitudinal cavity mode, detuned from the atomic D2 transition, dispersively interacts with the atomic ensemble. The coupling of the atomic ensemble to the standing-wave probe intensity is position and spin dependent. Probe light transmitted through the cavity mirrors therefore carries information about the collective position and spin of the ensemble, which is recorded using an optical heterodyne receiver. The interaction of the probe with the spin of the atomic ensemble results in a scalar and vector Stark shift of the atomic states, along with a dispersive cavity shift proportional to the total atomic spin component along the cavity axis. 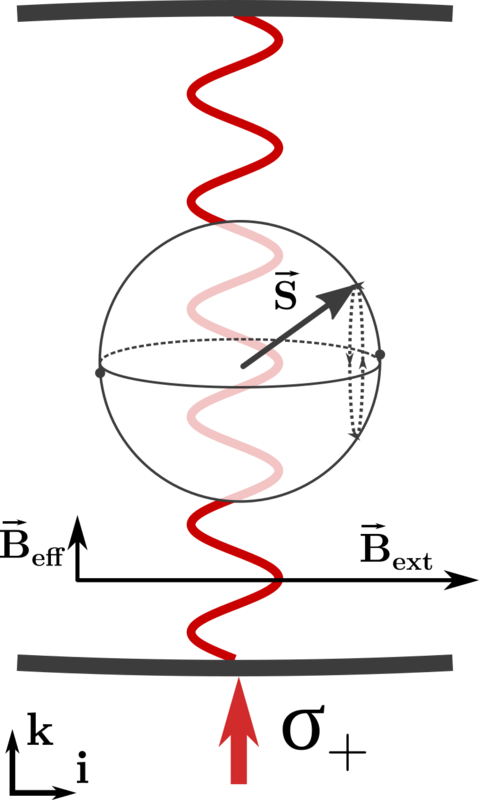 The vector component of the Stark shift is like an effective magnetic field along the cavity axis, and the dispersive shift facilitates measurement of one component of the total atomic spin. 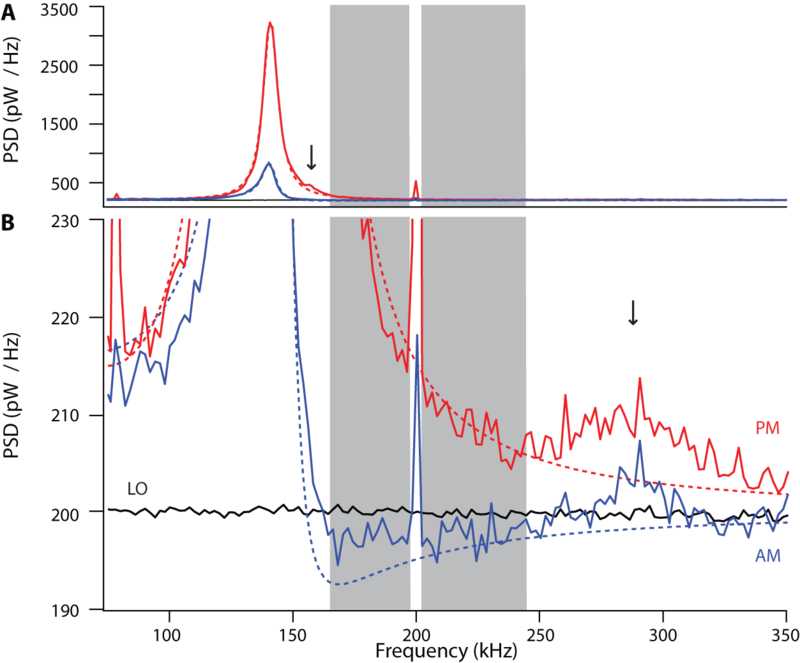 For small excitations, a spin-polarized atomic ensemble precessing around a transverse magnetic field can be described like a simple harmonic oscillator. The component of the total spin along the cavity axis is measured by the probe, resulting in measurement back-action in the orthogonal component, in order to satisfy the spin uncertainty relation. Considering these the position and momentum of a harmonic oscillator, respectively, this is directly analogous to cavity optomechanics, immediately yielding many similar results as developed in our previous theory paper. Our most recent experimental work has focused on realizing these spin-optodynamics analogues of optomechanics, as well as exploring some of the unique features a spin oscillator presents, such as a widely tunable Larmor frequency, a zero-temperature thermal bath, and a negative temperature, high-energy 'ground state'. 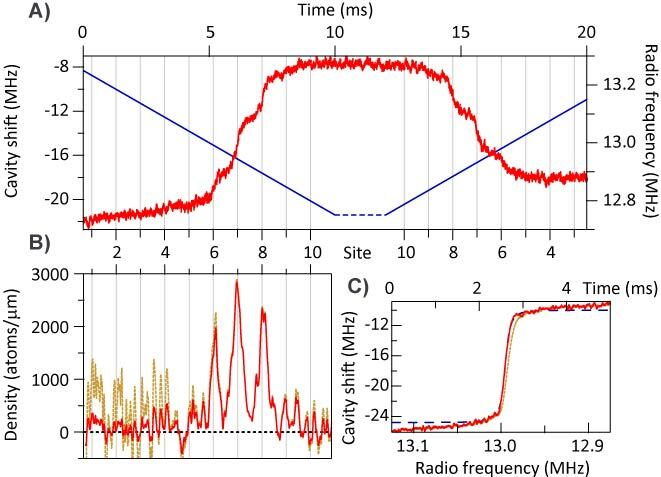 Applying a large magnetic-field gradient along the cavity axis, we can spatially address spins in different lattice sites using radio-frequency (RF) radiation. Top Schematic of atom-probe coupling for different well locations. 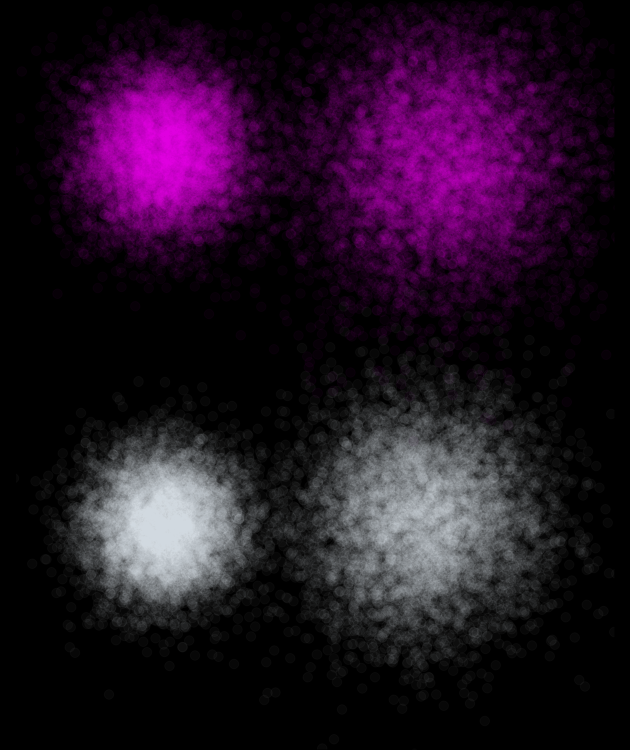 Atoms (grey points) sit at the bottom of the FORT potential (black dashed line). Since the FORT wavelength is incommensurate with that of the probe, different wells lead to different levels of coupling (green dots on blue curve). 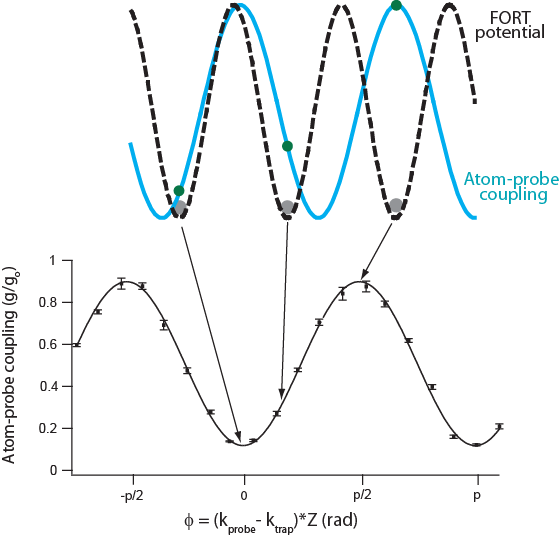 Bottom Experimentally obtained contrast plot highlighting the atom-probe coupling dependence on the location of the atom cloud. Our experimental setup, based on a micromachined atom chip, allows us to freely position the atoms relative to the probe standing wave. This enables both linear and quadratic optomechanical coupling. The strength of this coupling, along with the mechanical resonator frequency, can be tuned by varying the intracavity probe field intensity and its detuning from atomic resonance. The ensemble behaves similarly to a dispersive piece of glass, changing the effective length of the cavity.